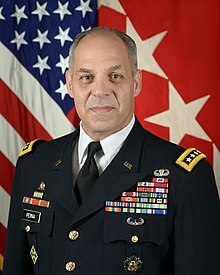 Gustave F. Perna (born 1960) is a United States Army four-star general who serves as the commanding general of United States Army Materiel Command. He assumed responsibilities as the 19th commanding general of the United States Army Materiel Command (AMC), headquartered at Redstone Arsenal in Alabama on September 30, 2016. Perna served for two years as the Army's Deputy Chief of Staff, G-4 in his previous assignment. He oversaw policies and procedures used by all Army logistic personnel throughout the world. Prior to joining the Army staff he served for two years as Deputy Chief of Staff, G-3/4, U.S. Army Materiel Command. He is a New Jersey native who attended Morris Hills High School, before graduating from Valley Forge Military Academy and College with an associate degree in Business Administration. Graduating as a Distinguished Military Graduate, he was commissioned as a second lieutenant, infantry officer in 1979 via the Early Commissioning Program from Valley Forge. He earned a bachelor's degree in Business Management from the University of Maryland and a master's degree in Logistics Management from the Florida Institute of Technology. His military education includes: Infantry Officer Basic Course, Ordnance Officer Advance Course, Logistics Executive Development Course, Support Operations Course, Command and General Staff College and Senior Service College. Perna's nomination for promotion to commanding general of the United States Army Materiel Command was confirmed by the U.S. Senate on September 15, 2016. He assumed command on September 30, 2016. ^ a b c d e "General Gustave F. Perna: Commanding General" (PDF). US Army Materiel Command. Retrieved 27 May 2018. This article incorporates text from this source, which is in the public domain. ^ "PN1668 — Lt. Gen. Gustave F. Perna — Army". U.S. Congress. Retrieved 2016-09-17. Wikimedia Commons has media related to Gustave F. Perna.